When an Apology is NOT an Apology | It's In The Sauce! There is much in the media in recent days about an apology that really is not an apology. The specifics of the “apology” is not my focus in this article. My intent is to differentiate when an apology is not really an apology, and give some pointers on how to give a sincere apology. Let’s forget how others do, or do not, apologize, and determine what we individually need to do about this. First of all, it is important to know when one should apologize. An apology should be given when one is clearly wrong; when we have said something to someone else, or about someone else, that isn’t true. This includes when one truly believed what turns out to be untrue; intent does not really matter. An apology should be given when one has hurt someone else, regardless of the intent. This hurt can be due to an overt action, such as saying something hurtful, or a covert action, which can include not doing something one should have done. In either case, when our action, or inaction, caused pain to someone else, we should apologize. This is true even if we think, or they say, that what we did wasn’t hurtful. When we are wrong, we should apologize. Relationships are more important than beliefs, political or otherwise. While we all have the right to our own opinions, when how such is discussed hurts others, an apology is appropriate. When we get into heated discussions with others about issues that are very close to our hearts, we usually personalize what we say in how we say it. This can result in unnecessary conflict. When such occurs, it is best to apologize. So, how do we apologize? An example. “I apologize for making those comments,” being specific about the comments. Not, “I apologize that YOU THOUGHT what I said was hurtful.” The first example is apologizing for our actions. The second example is apologizing for someone else’s feelings. Hopefully, the distinction is clear. Also, when apologizing, if you insert the word, “if” in your “apology,” you are not really apologizing at all; you are making a qualified apology, which really isn’t an apology. For instance, if you say, “I apologize IF what I said hurt your feelings,” you are placing the emphasis on the other person’s feelings, not your actions, and you are giving yourself an “out.” Put yourself in the other person’s place, and feel the difference in those two statements. 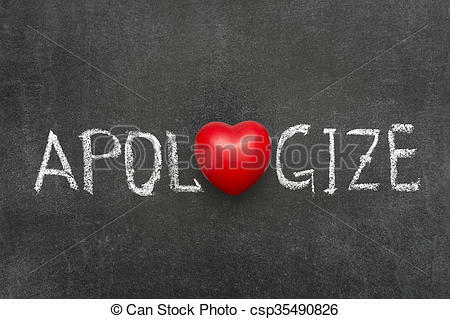 When apologizing, be careful that you do not justify your actions in any way, for that will in part negate the apology. If you say, “I apologize for what I said, but I am just direct; that is just the way I am!” Does that sound sincere? Probably not, because it isn’t; it is excusing our own behavior, and the “apology” sounds and feels hollow. We should apologize for what we did, and not justify it in any way. Hopefully we know when we need to apologize, and do not need others to tell us. But if we do hear from someone else who we trust that we were wrong and an apology is in order, it is best to apologize, and to do so quickly. As in the case of thank you notes, the sooner the better. It is best to say, “I apologize,” instead of “I am sorry.” I heard this distinction made years ago. Although initially the difference in these two may not sound significant, there is a difference. The words, “I am sorry,” are more emotional than action oriented, focusing on the feelings of the one apologizing. The words, “I apologize,” followed by what one is apologizing for, focus on the impact of one’s actions on the other person. There are clearly people who find it easier to apologize than others, even when they believe they are wrong. There are different reasons for this. Regardless, when an apology is in order, be concerned enough about relationships to get outside of yourself and do what may not be easy, but appropriate. No one is perfect in this issue of relationships, so any of us can find ourselves in the position of needing to apologize to someone else for our actions, or inactions. Being secure enough in ourselves to do so is often what separates those who have good relationships from those who don’t. This entry was posted in Relationships and tagged apologize, business relationships, family relationships, forgiveness, friend relationships. Bookmark the permalink.